An analysis of over a million people spanning two decades has revealed that while the month in which you’re born might not affect your behavior or personality, it could have an impact on your health. A new study, published in the Journal of American Medical Informatics Association, shows that the risk of developing certain diseases might be influenced by the season in which you entered this world. However, Nicolas Tatonetti, the study’s lead author, does stress: “It’s important not to get overly nervous about these results because even though we found significant associations the overall disease risk is not that great. The risk related to birth month is relatively minor when compared to more influential variables like diet and exercise.” So don’t get too worked up about this data; maybe go eat an apple. 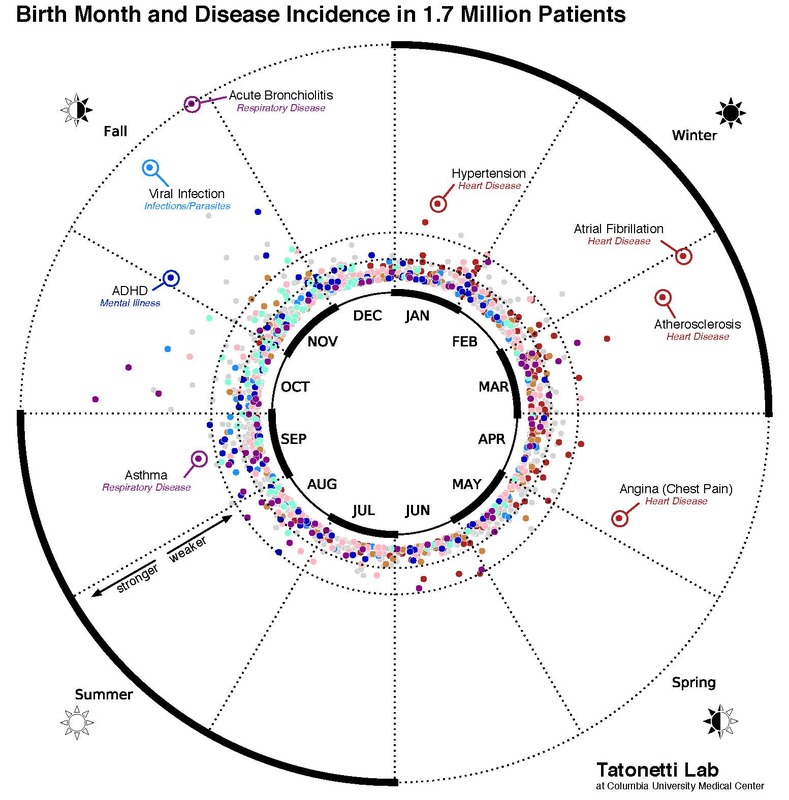 The researchers, from Columbia University, looked at the relationship between birth month and disease risk for 1.7 million people who had been admitted to the New York-Presbyterian Hospital between 1985 and 2013. By comparing over 1,600 illnesses to when in the year the patients were born, they found 55 diseases that could be correlated. 39 of these diseases were already thought to have a potential link to a person’s season of birth, but this new research uncovered a further 16 associations that nobody had noticed. These included nine different types of heart disease. For example, if you were born in March, you might have a greater risk of congestive heart failure. Among other risks, the likelihood of developing asthma is greater in babies born in July and October, whereas the risk of ADHD peaks for children born in November. This is apparently consistent with previous data, which has shown similar results. The data suggests that around 1 in every 675 incidents of ADHD can be related to being born in New York in November. The location and time of year are important. Apparently, similar studies from Denmark have shown that the same diseases peak not at the same month as they do in New York, but at the time of year at which sunlight levels are similar. The researchers plan on investigating this further by extending the study to different parts of the United States and even looking at data from different countries. No one’s quite sure what exactly might be at work here. It’s possibly related to the environmental factors to which babies are exposed at birth, but, by working out what causes these variations, the scientists hope to figure out a way to close the gaps.